صداقت, اکرم, عبدالخانی, علی, خدائیان چگینی, فرامرز. (1394). استخراج و خالص‌سازی لیگنان زیست‌فعال ماتایی‌رزینول موجود در گره‌های گونه‌ی سرو سیمین (Cupressus arizonica). 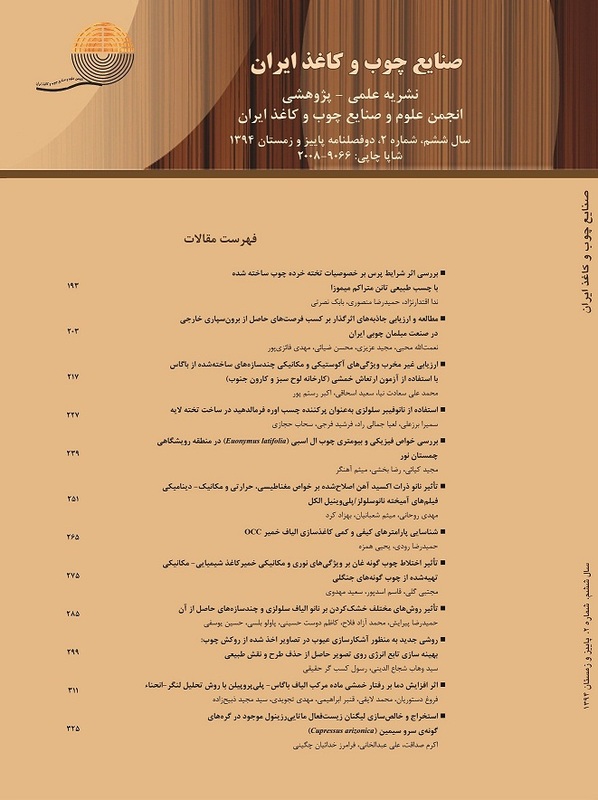 مجله صنایع چوب و کاغذ ایران, 6(2), 325-331. اکرم صداقت; علی عبدالخانی; فرامرز خدائیان چگینی. "استخراج و خالص‌سازی لیگنان زیست‌فعال ماتایی‌رزینول موجود در گره‌های گونه‌ی سرو سیمین (Cupressus arizonica)". مجله صنایع چوب و کاغذ ایران, 6, 2, 1394, 325-331. صداقت, اکرم, عبدالخانی, علی, خدائیان چگینی, فرامرز. (1394). 'استخراج و خالص‌سازی لیگنان زیست‌فعال ماتایی‌رزینول موجود در گره‌های گونه‌ی سرو سیمین (Cupressus arizonica)', مجله صنایع چوب و کاغذ ایران, 6(2), pp. 325-331. صداقت, اکرم, عبدالخانی, علی, خدائیان چگینی, فرامرز. استخراج و خالص‌سازی لیگنان زیست‌فعال ماتایی‌رزینول موجود در گره‌های گونه‌ی سرو سیمین (Cupressus arizonica). مجله صنایع چوب و کاغذ ایران, 1394; 6(2): 325-331. Holmbom, B., Echerman, C., Eklund, P., Hemming, J., Nisula, L., Reunanen, M., Sjoholm, R., Sundberg, A., Sundberg, K. and willfor, S., 2003. Knots in trees-A new rich source of lignans. Phytochemistry Reviews, 2: 331-340. Holmbom, B., Willfor, S., Hemming, J., pietarinen, S., Nisula, L., Eklund, P. and Sjoholm, R., 2007. Knot in trees: A rich source of bioactive polyphenols. In: Materials, chemicals and energy from forest biomass. Eds: Argyropoulos, D., Oxford University press. 350-362. He, Ch., pan, Y., Ji, X. and Wang, H: Antioxidant introduction., 2012. In: Antioxidant polymers systhesis, production and applications, cirillo, G., and Iemma, F Ed., Scrivener publication, Calabria, Italy. 1-23. Neacus, M., Eklund, P. C., Sjoholm, R. E., Pietarinen, S. P., Ahotupa, M. O., Holmbom, B. R. and willfor, S. M., 2007. Antioxidant flavonoids from knotwood of Jack pine and European aspen. Holz Roh werkst, 65: 1-6. Umezawa, T., 2001. Chemistry of extractives. Kyoto: Kyoto university press. 213-232. Sok, D. E., Cui, H. S. and Kim, R. M., 2009. Isolation and bioactivities of furfuran type lignan compounds from edible plants. Food, nutrition and agriculture, 1: 87-95. Deyama, T. and Nishibe, S., 2010. Pharmacological properties of lignans in: lignin and lignin, Eds: Heitner, C., Dimmel, D. R and Schmidt, J. A, CRC press, NewYork: 585-620. Kim, C. Y., Ahn, M. J. and Kim. J., 2006. Apreparative isolation and purification of arctigenin and matairesinal from Forsythia koreana by Centrifugal partition chromatography. Separation Science, 29: 656-659. Fischer, J., Reynolds, A. J., Sharp, L. A. and sherburn, M. S., 2004. Radical Carboxyrylation approach to lignans, total synthesis of arctigenin, matairesinol and related natural products. Organic letters, 6: 1345-1348. Si, C. L., Jiang, J. Z., Liu, S. C., Hu, H. Y., Ren, X. D., Yu, G. J. and Xu, G. H., 2012. Anew lignan glycoside and phenolics from the branch wood of pinus banksiana Lambert. Holzforschung, 67 (4): 357-363. Piispanen, R., willfor, S., saranpaa, P. and Holmbom, B., 2008. Variation of lignans in Norway spruce (Picea abies [L.] Karst.) Knotwood: within- stem vaviation and the effect of fertilization at two experimental sites in finland. Trees, 22: 317-328.